I must admit, this was pretty fantastic to crochet! The yarn kept shifting colors, the stitches were fairly straightforward, and the rows just got longer and longer, so it was the perfect project for zoning out on the train or TV-watching. 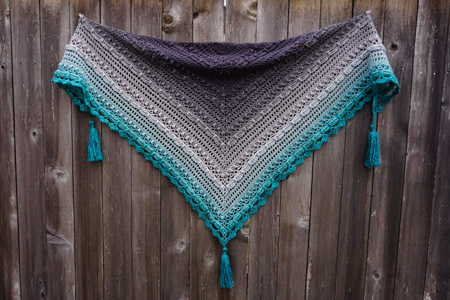 Pattern: Lost in Time Shawl from Mijo Crochet, by Johanna Lindahl. It’s a nicely written free pattern! Yarn: Scheepjes Whirl, in Green Tea Tipple, about 185 grams/900 yards. Very cool yarn – first of all, it’s cotton/acrylic (no animal fiber). 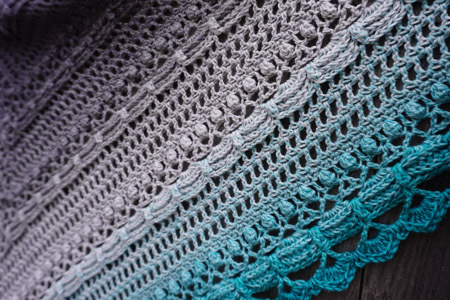 Second of all, one skein ($29) is more than a thousand yards – plenty for a shawl! And last, the gradient is achieved by changing out one ply at a time, until eventually all plies are changed from dark gray to light gray, etc. Crochet hook: size E/3.5mm from the Clover Takumi Getaway Soft Touch set. Finished dimensions: about 54″ across the top, and 24.5″ from top edge to tip (excluding tassels). The shawl feels a bit small to me, but there just wasn’t enough yarn for another repeat – repeats are 12 rows high, and the rows just keep getting longer and longer, so it was actually quite a bit of yarn to eek out another repeat. I worked rows 15-26 a total of four times (a total of 5 “ruffles”). On the plus side, having a lot of yarn left over meant I could make huge tassels! Love this colored combo! Must Make! This is going to be my next project. I have been admiring it for a month now and figured out which yarn I think I will be using. 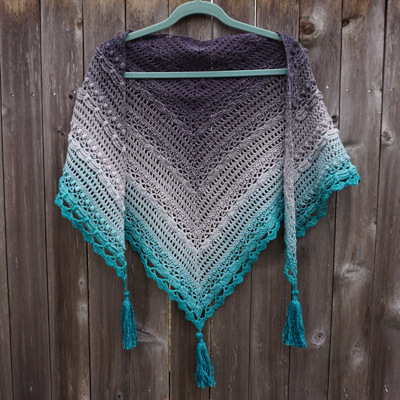 I’m very interested in what yarns people have used to make this beautiful shawl. Thanks for showing this off – it looks great! This is just beautiful. I love how you sorted the colors. And it looks so snuggly. Beautiful! You crochet and knit, awesome! Me encanta este patrón:Lo he empezado ayer y solo llevo 15 vueltas, pero no se porque al empezar las vueltas se me esta curvando hacia arriba.